In the Trenches (ITT) enables players to game historically accurate simulations of tactical operations from The Great War. ITT challenges players to move and fight with company-level units during 5-minute, impulse-based turns on historically accurate maps scaled to 100 yards per hex. This approach recreates WWI command and control problems to inspire historically accurate play without forcing decisions. 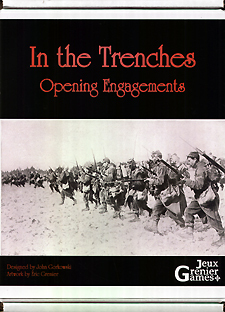 In the Trenches: Opening Engagements includes three operations. "Cavalry Eclipsed" features Austrian and Russian cavalry, "Elan" simulates an encounter between French and German forces during the Battle of the Frontiers, and "Rising Sun" depicts the Japanese and British assault on the German colony of Tsingtao in China. Included in In the Trenches: Opening Engagements are three 12" x 18" maps, 300+ counters, one 27-page rulebook, three operation guides, one reference card, and two D6s.